Alameda Co. Deputy Sheriff, sterling silver, hand engraved. Noted Alameda County historian and collector James Bolander told me that this badge is one of four ordered from Oakland Jeweler and watchmaker Geo. Fake in the late 1890's. 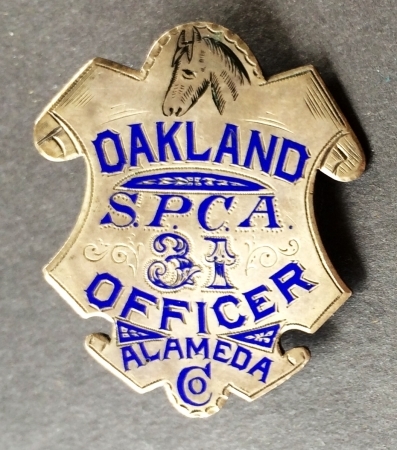 Alameda Co. Oakland SPCA Officer, #31, sterling silver, hand engraved. Hallmarked Morton Jeweler Co. Oakland, CA. Geo. Fake was now working for Morton and you can see his signature enameled engraving. Alameda Co. Deputy Sheriff, sterling silver, hand engraved, all block lettering. Alameda Co. Deputy Sheriff, sterling silver, hand engraved, block and carnival lettering. Presented To / Grant D. Miller / Jan. 19 - 1915 / BY / Robt. W. Martland / E. V. Tiffany / H. Gallagher / Berg Bros. / Taylor & CO / Bessie J. Wood / C. J. Truman / W. W. Whitten / Western Casket Co. / Oak. Cremation Assn. / T. C. Drennan / P. Kimberlin / H. Miller / Alter, Pratt & Richmond / C. S. Graham / R. G. Morgan / F. F. Bontella / J. D. Ryan / H. Miller Jr. / F. Briscoe / H. Frank. Lewis Cass Morehouse was elected Constable Eden Township Alameda County in 1866. 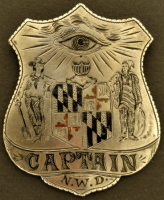 His badge, shown above is 4" tall. Custom painted sign, Alameda County Sheriff's Mounted Posse. Walter Blumert Deputy. Walter was born April 6, 1894 and passed in July 1967. He later served as a Deputy for Sheriff Harry Morse. Alameda Co. Deputy Sheriff, sterling silver, hand engraved. Alameda Co. Deputy Sheriff, sterling silver, hand engraved, Block and Roman lettering. Alameda Co. Deputy Sheriff, sterling silver, hand engraved, #479. Alameda Co. Deputy Sheriff, sterling silver, hand engraved, block lettering. Alameda Co. Deputy Sheriff, gold front, #57 with applied horse head. 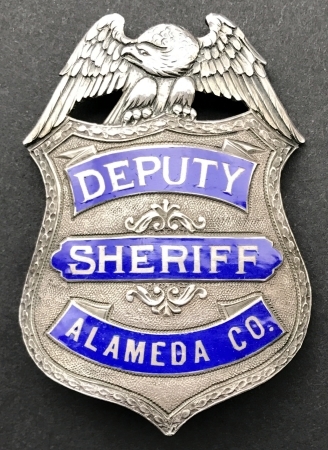 Alameda Co. Deputy Sheriff badge. Obverse marked Ger. Silver and 906 Bdwy. Oakland, CAL. 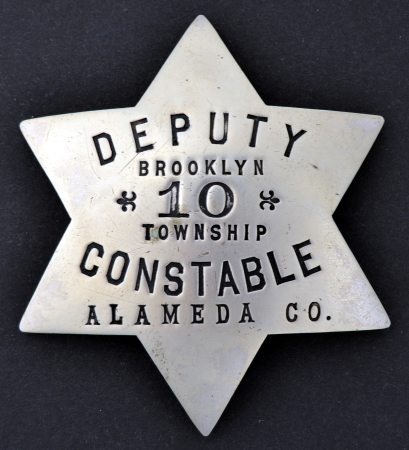 Alameda Co. Deputy Constable badge. Obverse marked California. Oakland, CAL. 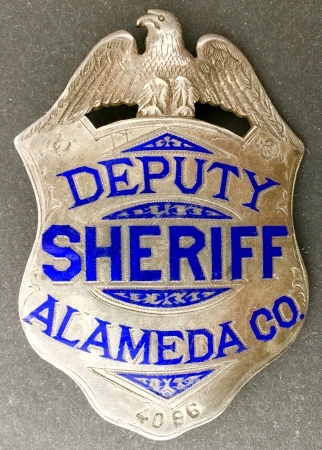 Alameda Co. Deputy Sheriff badge. 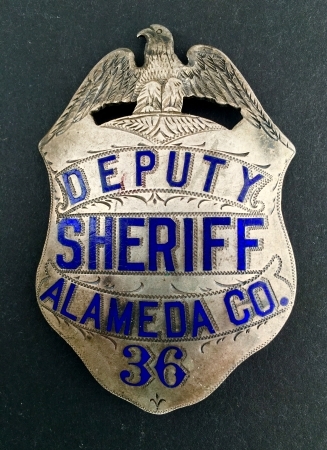 Alameda Co. Deputy Sheriff badge. Obverse marked Ger. Silver and 853 40th St. Oakland, CAL. Hayward, CA Deputy Marshal, sterling silver, hand engraved. Circa 1900. Emeryville, CA police badge #15, sterling silver. Circa 1930. Alameda, CA Inspector #4 police badge, sterling silver. Circa 1945.
silver. Hallmarked Patrick and MK Co. SF. Alameda Co. Deputy Sheriff, sterling silver, hand engraved. Made by Oakland Jeweler and watchmaker Geo. Fake. 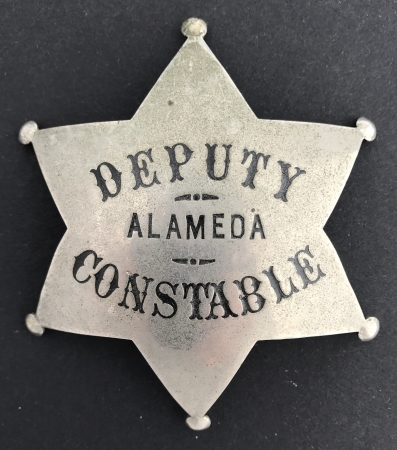 Noted Alameda County historian and collector James Bolander advised me that this badge is the first deparment issue and that after the deparment went to a new style, these badges were numbered and issued to Special Deputies. Alameda Co. Deputy Constable badge #10 from the Brooklyn Township. Alameda Co. Deputy Sheriff badge #5, sterling silver, hand engraved. Made by Hutchison Oakland, CAL. Alameda Co. Deputy Sheriff badge #36, sterling silver, hand engraved. This badge belonged to Earl Warren and was obtained by noted Alameda County historian and collector James Bolander. Earl Warren went on to become the Govenor of California and later became the Chief Justice of the U.S. Supreme Court. Alameda Co. Deputy Sheriff badge #90, sterling silver, hand engraved. Alameda Co. Deputy Coroner badge #5, sterling silver, hand engraved. 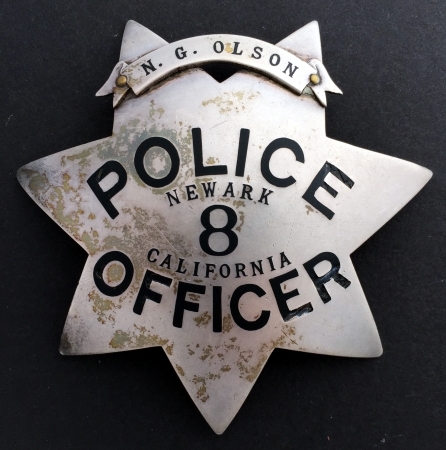 Newark, CA Police Officer #8 badge, personalized to N. G. Olson, made of sterling silver. Hallmarked Ed Jones & Co. Oakland, CAL. 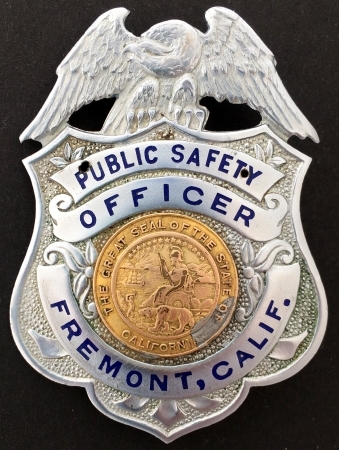 Fremont, CA Public Safety Officer badge. 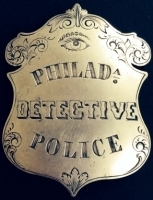 This was the first issued badge style at the time the city was incorporated on Jan. 23, 1956. Police and Fire officers were called Public Safety officers for the first year and then they were divided up into two seperate departments, Police and Fire. The badges were sent back to Ed Jones Co. and panels were added over the words Public Safety that specified Police or Fire. Hallmarked Ed Jones & Co. Oakland, CAL. 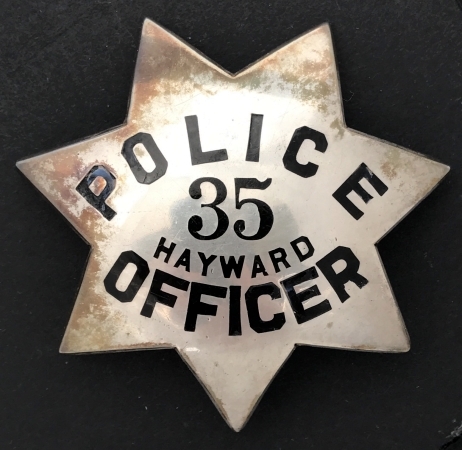 Hayward, CA Police badge #35, sterling silver, worn by Officer Bill Johnson. Made by Irvine & Jachens and dated on the reverse 8-30-55. Has Jewelry Workers Union Stamp #70. 1956 Newark, CA Police Department, 1st day of service and first Chief and original four officers. 1st issue Alameda, CA Police Officer badge #15, sterling silver. Hallmarked A.O. Gott Alameda STERLING. In 1894 Arthur O. Gott was listed as Jeweler and Optician. Address 1413 Park Alameda. Alameda Co. Deputy Sheriff badge, sterling silver, hard fired reverse blue enamel. Alameda County Deputy Sheriff Connie Sebrell 1965-67. 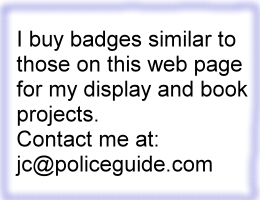 Police Officer shown wearing a badge #15 gives the viewer an idea of the uniform of the day. John Edward Becker was born in 1867 and for many years resided on Crosby St. Alameda, CA. He enjoyed police work and also worked as a Southern Pacific Railroad Officer. He enlisted in the National Guard on Nov. 10, 1899 and was a Sergeant in 6th Infantry 3rd Brigade. He died in Alameda on May 13, 1925 at age 58.